The Melrose beach wheelchair has been developed to enable disabled access to the beach and water. 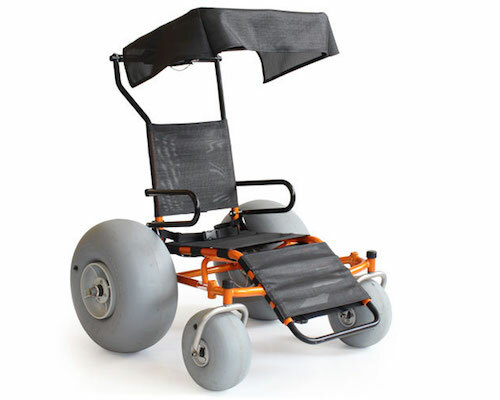 Large tyres provide a low-pressure footprint allowing the Melrose beach wheelchair to float over the softest sand or pebble beaches to reach the water. Fabricated from aluminium with a high impact nylon mesh for the upholstery, the Melrose beach wheelchair is light enough to toss in the back of the car. The wheels can be easily removed and the back folds down so storage is no problem. Now you have the opportunity to explore wonderful places.